The upcoming 2.3 version of Profiler includes support for the latest YARA engine. This new release is scheduled for the first week of January and it will include YARA on all supported platforms. 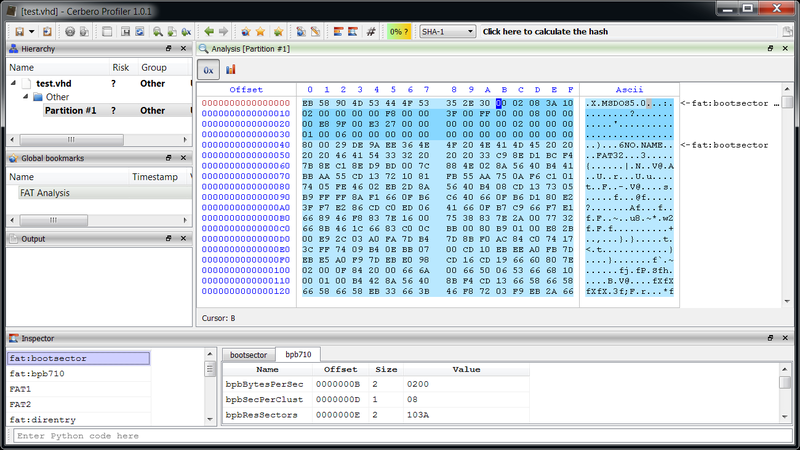 One inherent technical advantage of having YARA support in Profiler is that it will be possible to scan for YARA rules inside embedded files/objects, like files in a Zip archive, in a CHM file, in an OLEStream, streams in a PDF, etc. The YARA engine itself has been compiled with all standard modules (except for cuckoo). 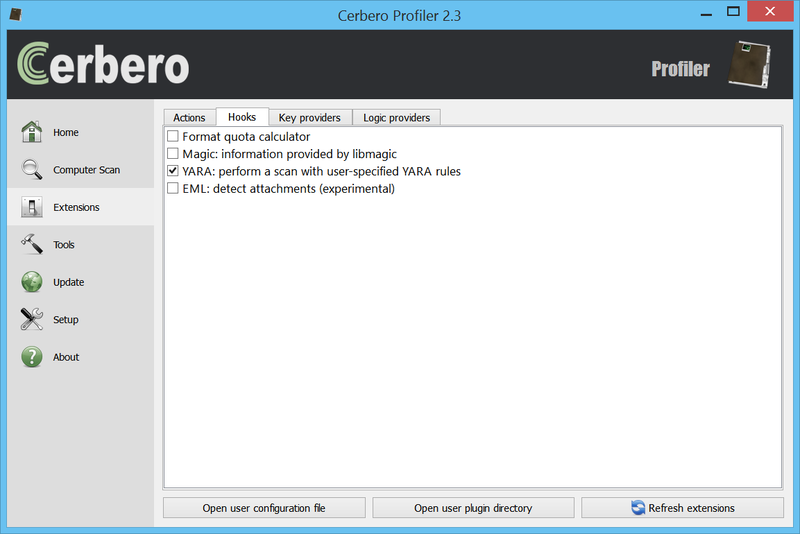 Even the magic module is available, since libmagic is also supported by Profiler. So let’s start a YARA scan. To do that, we need to enable the YARA hook extension. On Windows remember to configure Python in case you haven’t yet, since all extensions have been written in it. 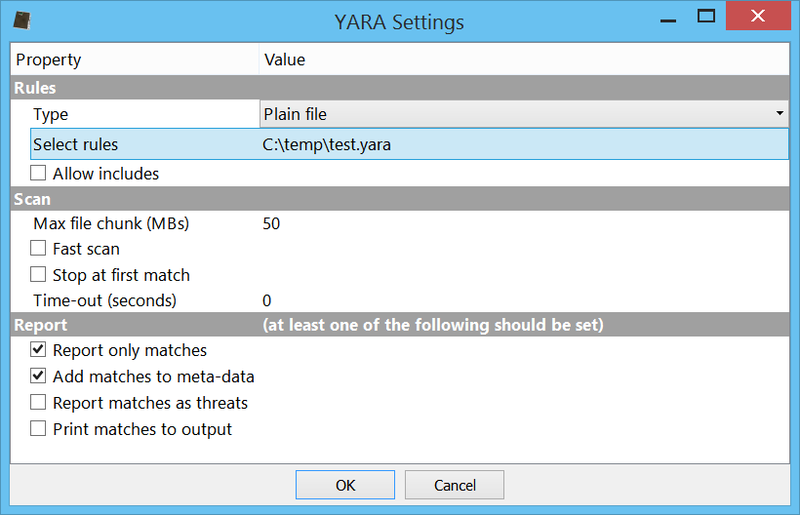 When a scan is started, a YARA settings dialog will show up. This dialog lets us choose various settings including the type of rules to load. There are four possibilities. 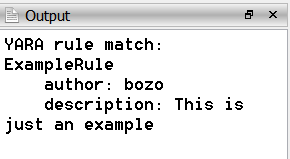 A simple text field containing YARA rules, a plain text rules file, a compiled rules file or a custom expression which must eval to a valid Rules object. The report settings specify how we will be alerted of matches. The ‘only matches’ option makes sure that only files (or their sub-files) with a match will be included in the final report. The ‘add to meta-data” option causes the matches to be visible as meta-data strings of a file. The ‘as threats’ option reports every match as a 100% risk threat. The ‘print to output’ option prints the matches to the output view. Since we had the ‘only matches’ option enabled, we will find only matching files in our final report. And since we had also the ‘to meta-data’ option enabled, we will see the matches when opening a file in the workspace. 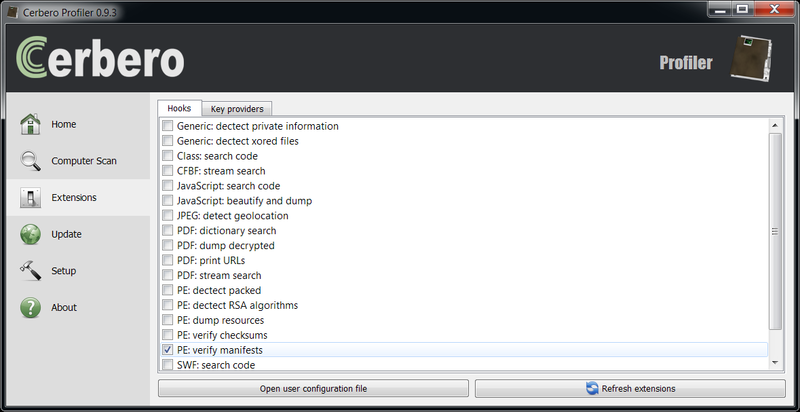 The YARA scan functionality comes also as an action when we find ourselves in a hex view. You can either scan the whole hex data or select a range. 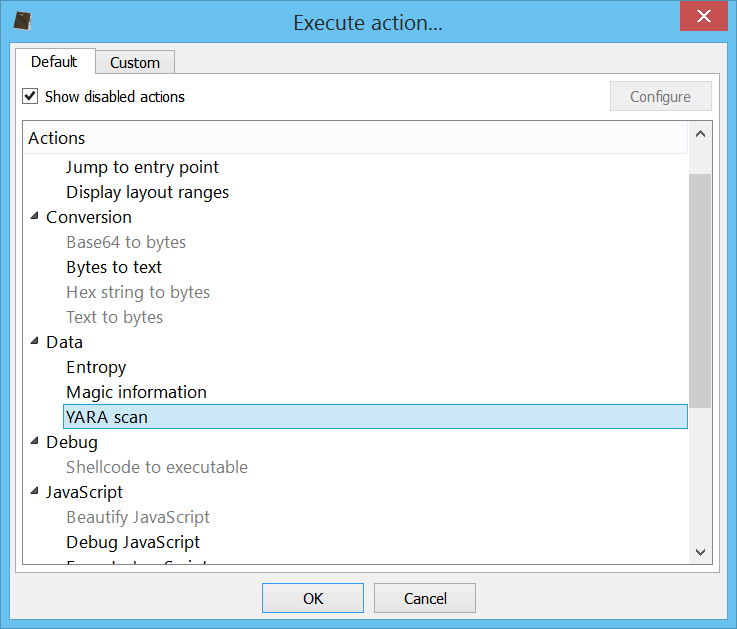 Then press Ctrl+R to run an action and select ‘YARA scan’. In this case we won’t be given report options, since the only thing which can be performed is to print out matches in the output view. Of course, all supported platforms come also with the official YARA command line utility. Since this has been a customer request for quite some time, I think it will be appreciated by some of our users. This post isn’t about upcoming features, it’s about things you can already do with Profiler. What we’ll see is how to import structures used for file system analysis from C/C++ sources, use them to analyze raw hex data, create a script to do the layout work for us in the future and at the end we’ll see how to create a little utility to recover deleted files. The file system used for this demonstration is FAT32, which is simple enough to avoid making the post too long. Note: Before starting you might want to update. The 1.0.1 version is out and contains few small fixes. Among them the ‘signed char’ type wasn’t recognized by the CFFStruct internal engine and the FAT32 structures I imported do use it. While ‘signed char’ may seem redundant, it does make sense, since C compilers can be instructed to treat char types as unsigned. 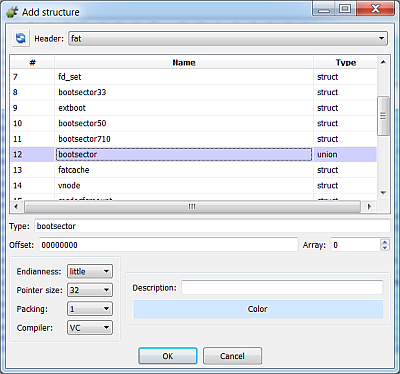 Importing file system structures from C/C++ sources is easy thanks to the Header Manager tool. In fact, it took me less than 30 minutes to import the structures for the most common file systems from different code bases. Click here to download the archive with all the headers. Copy the files to your user headers directory (e.g. 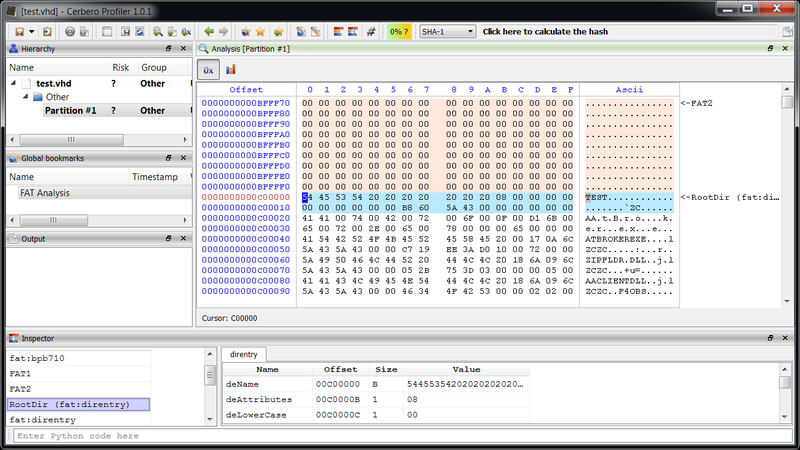 “AppData\Roaming\CProfiler\headers”). It’s better to not put them in a sub-directory. Please note that apart from the FAT structures, none of the others have been tried out. Note: Headers created from Linux sources contain many additional structures, this is due to the includes in the parsed source code. This is a bit ugly: in the future it would be a good idea to add an option to import only structures belonging to files in a certain path hierarchy and those referenced by them. Since this post is about FAT, we’ll see how to import the structures for this particular file system. But the same steps apply for other file systems as well and not only for them. If you’ve never imported structures before, you might want to take a look at this previous post about dissecting an ELF and read the documentation about C++ types. Now we can click on ‘Import’. That’s it! We now have all the FAT structures we need in the ‘fat’ header file. It should also be mentioned that I modified some fields of the direntry structure from the Header Manager, because they were declared as byte arrays, but should actually be shown as short and int values. Before going on with the FAT analysis, we need to briefly talk about the MBR. FAT partitions are usually found in a larger container, like a partitioned device. To perform my tests I created a virtual hard-disk in Windows 7 and formatted it with FAT32. As you might be able to spot, the VHD file begins with a MBR. In order to locate the partitions it is necessary to parse the MBR first. The format of the MBR is very simple and you can look it up on Wikipedia. In this case we’re only interested in the start and size of each partition. 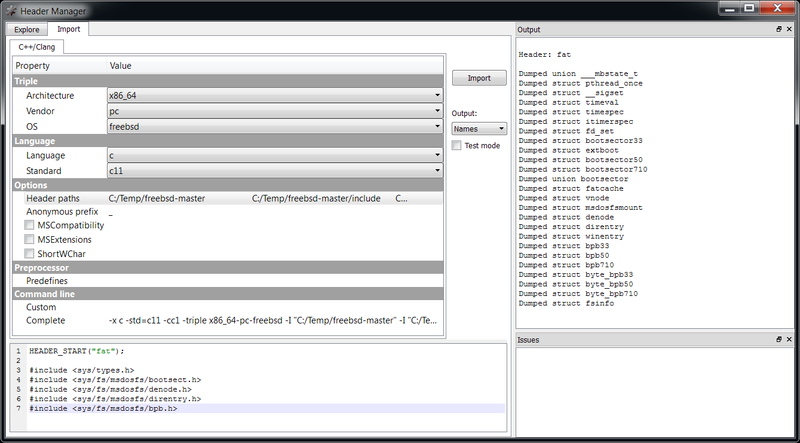 Profiler doesn’t yet support the MBR format, although it might be added in the future. In any case, it’s easy to add the missing feature: I wrote a small hook which parses the MBR and adds the partitions as embedded objects. 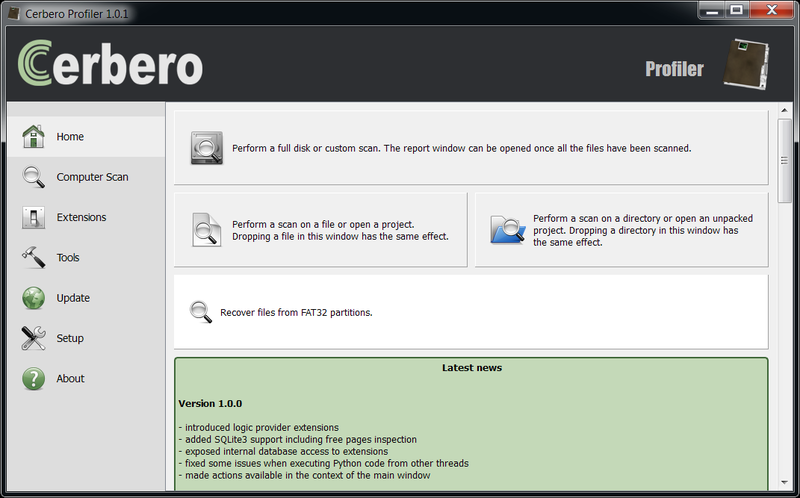 And now we can inspect the partitions directly (do not forget to enable the hook from the extensions). The basics of the FAT format are quite simple to describe. The data begins with the boot sector header and some additional fields for FAT32 over FAT16 and for FAT16 over FAT12. We’re only interested in FAT32, so to simplify the description I will only describe this particular variant. The boot sector header specifies essential information such as sector size, sectors in clusters, number of FATs, size of FAT etc. It also specifies the number of reserved sectors. These reserved sectors start with the boot sector and where they end the FAT begins. The ‘FAT’ in this case is not just the name of the file system, but the File Allocation Table itself. The size of the FAT, as already mentioned, is specified in the boot sector header. Usually, for data-loss prevention, more than one FAT is present. Normally there are two FATs: the number is specified in the boot sector header. The backup FAT follows the first one and has the same size. 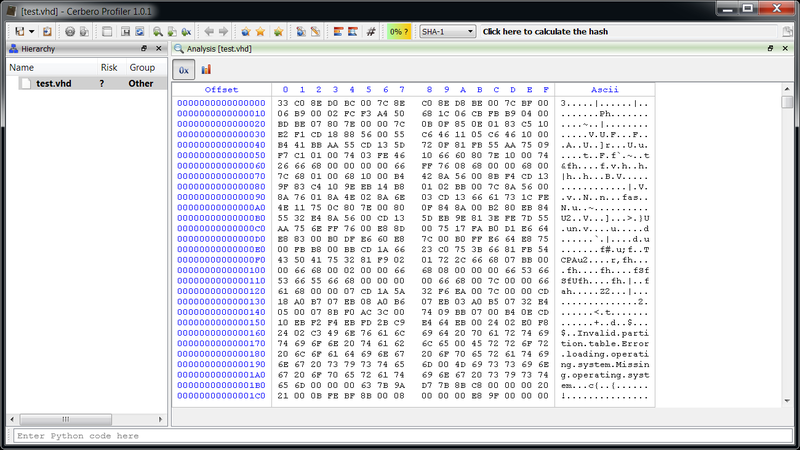 The data after the FAT(s) and right until the end of the partition includes directory entries and file data. The cluster right after the FAT(s) usually starts with the Root Directory entry, but even this is specified in the boot sector header. The FAT itself is just an array of 32-bit indexes pointing to clusters. The first 2 indexes are special: they specify the range of EOF values for indexes. It works like this: a directory entry for a file (directories and files share the same structure) specifies the first cluster of said file, if the file is bigger than one cluster, the FAT is looked up at the index representing the current cluster, this index specifies the next cluster belonging to the file. If the index contains one of the values in the EOF range, the file has no more clusters or perhaps contains a damaged cluster (0xFFFFFFF7). Indexes with a value of zero are marked as free. Cluster index are 2-based: cluster 2 is actually cluster 0 in the data region. This means that if the Root Directory is specified to be located at cluster 2, it is located right after the FATs. Hence, the size of the FAT depends on the size of the partition, and it must be big enough to accommodate an array large enough to represent every cluster in the data area. Note: When adding a structure make sure that it’s packed to 1, otherwise field alignment will be wrong. Then we highlight the FATs. And the Root Directory entry. This last step was just for demonstration, as we’re currently not interested in the Root Directory. Anyway, now we have a basic layout of the FAT to inspect and this is useful. Let’s now make our analysis applicable to future cases. Manually analyzing a file is very useful and it’s the first step everyone of us has to do when studying an unfamiliar file format. However, chances are that we have to analyze files with the same format in the future. That’s why we could write a small Python script to create the analysis layout for us. We’ve already seen how to do this in the post about dissecting an ELF. We can create an action with this code or just run it on the fly with Ctrl+Alt+R. Now that we know where the FAT is located and where the data region begins, we can try to recover deleted files. There’s more than one possible approach to this task (more on that later). What I chose to do is to scan the entire data region for file directory entries and to perform integrity checks on them, in order to establish that they really are what they seem to be. They are allowed in long file names only. Stored as A–Z. Allowed in long file names. We can exclude these entries by making sure that the deAttributes/weAttributes isn’t ATTR_WIN95 (0xF). Once we have confirmed the integrity of the file name and made sure it’s not a long file name entry, we can validate the deAttributes. It should definitely not contain the flags ATTR_DIRECTORY (0x10) and ATTR_VOLUME (8). Finally we can make sure that deFileSize isn’t 0 and that deHighClust combined with deStartCluster contains a valid cluster index. # has it been deleted? # we have found a deleted file entry! This script is to be run on the fly with Ctrl+Alt+R. It’s not complete, otherwise I would have added a wait box, since like it’s now the script just blocks the UI for the entire execution. We’ll see later how to put everything together in a meaningful way. We can see many false positives in the list. The results would be cleaner if we allowed only ascii characters in the name, but this wouldn’t be correct, because short names do allow values above 127. We could make this an extra option, generally speaking it’s probably better to have some false positives than missing valid entries. Among the false positives we can spot four real entries. What I did on the test disk was to copy many files from the System32 directory of Windows and then to delete four of them, exactly those four found by the script. The next step is recovering the content of the deleted files. The theory here is that we retrieve the first cluster of the file from the directory entry and then use the FAT to retrieve more entries until the file size is satisfied. 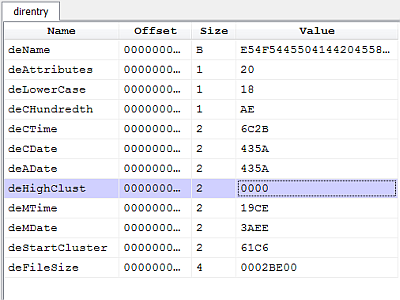 The cluster indexes in the FAT won’t contain the next cluster value and will be set to 0. We look for adjacent 0 indexes to find free clusters which may have belonged to the file. Another approach would be to dump the entire file size starting from the first cluster, but that approach is worse, because it doesn’t tolerate even a little bit of fragmentation in the FAT. Of course, heavy fragmentation drastically reduces the chances of a successful recovery. However, there’s a gotcha which I wasn’t aware of and it wasn’t mentioned in my references. 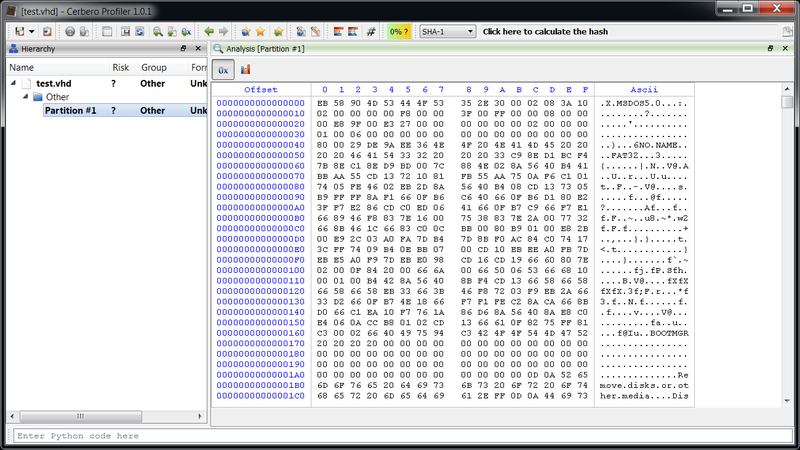 Let’s take a look at the deleted directory entry of ‘notepad.exe’. In FAT32 the index of the first cluster is obtained by combining the high-word deHighClust with the low-word deStartCluster in order to obtain a 32-bit index. The problem is that the high-word has been zeroed. The actual value should be 0x0013. Seems this behavior is common on Microsoft operating systems as mentioned in this thread on Forensic Focus. Files which have no signature (like text files) or are not identified won’t be recovered. The name of the files won’t be recovered at all, unless they contain it themselves, but that’s unlikely. Disadvantages notwithstanding I think that if one had to choose between the two approaches the second one holds higher chances of success. So why then did I opt to do otherwise? Because I thought it would be nice to recover file names, even though only partially and delve a bit more in the format of FAT32. The blunt approach could be generalized more and requires less FAT knowledge. However, the surely best approach is to combine both systems in order to maximize chances of recovery at the cost of duplicates. But this is just a demonstration, so let’s keep it relatively simple and let’s go back to the problem at hand: the incomplete start cluster index. The cluster containing the deleted entry must also contain a valid file directory entry. The FAT can’t be heavily fragmented, otherwise the retrieved high-word might not be correct. Still I think it’s interesting and while it might not always be successful in automatic mode, it can be helpful when trying a manual recovery. It tries to find a valid file directory entry before and after the deleted entry, remaining in the same cluster. Now we can write a small function to recover the file content. All the pieces are there, it’s time to bring them together. With the recently introduced logic provider extensions, it’s possible to create every kind of easy-to-use custom utility. Until now we have seen useful pieces of code, but using them as provided is neither user-friendly nor practical. Wrapping them up in a nice graphical utility is much better. What follows is the source code or at least part of it: I have omitted those parts which haven’t significantly changed. You can download the full source code from here. descr = Recover files from a FAT32 partition or drive. s.ascii_names_conv = "strict" if opts.value(1) else "replace"
When the tool is activated it will ask for the disk file to be selected, then it will show an options dialog. In our case we can select the option ‘Ascii only names’ to exclude false positives. The options dialog asks for a directory to save the recovered files. In the future it will be possible to save volatile files in the temporary directory created for the report, but since it’s not yet possible, it’s the responsibility of the user to delete the recovered files if he wants to. All four deleted files have been successfully recovered. Three executables are marked as risky because intrinsic risk is enabled and only ‘ntoskrnl.exe’ contains a valid digital certificate. I’d like to remind you that this utility hasn’t been tested on disks other than on the one I’ve created for the post and, as already mentioned, it doesn’t even implement the best method to recover files from a FAT32, which is to use a signature based approach. It’s possible that in the future we’ll improve the script and include it in an update. The purpose of this post was to show some of the many things which can be done with Profiler. I used only Profiler for the entire job: from analysis to code development (I even wrote the entire Python code with it). And finally to demonstrate how a utility with commercial value like the one presented could be written in under 300 lines of Python code (counting comments and new-lines). 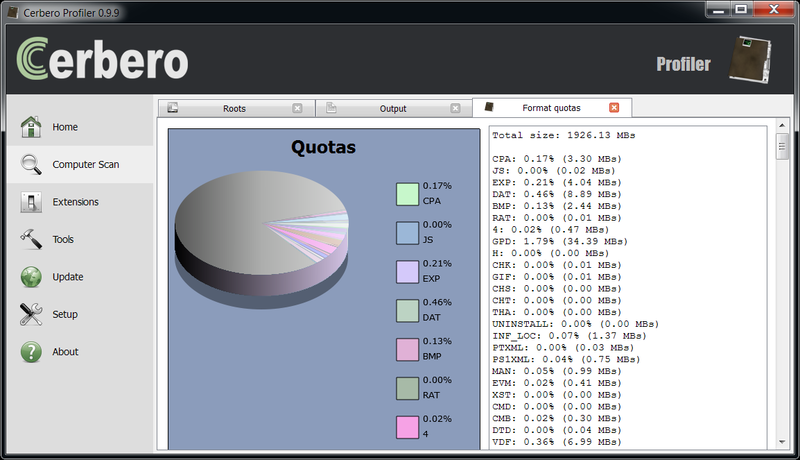 It hugely simplifies the analysis of files. In fact, I used only two external Python functions: one to check the existence of a directory and one to normalize the path string. It helps building a fast robust product. It offers a graphical analysis experience to the user with none or little effort. It gives the user the benefit of all the other features and extension offered by Profiler. To better explain what is meant by the last point, let’s take the current example. 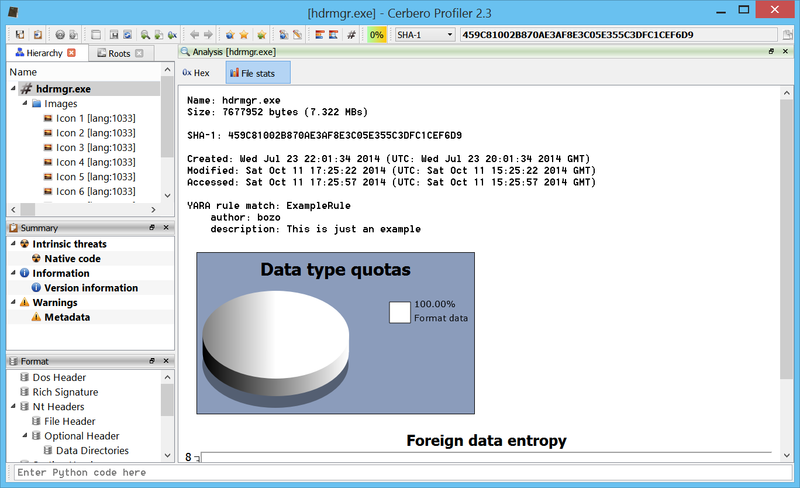 Thanks to the huge amount of formats supported by Profiler, it will be easy for the user to validate the recovered files. In the case of Portable Executables it’s extremely easy because of the presence of digital certificates, checksums and data structures. But even with other files it’s easy, because Profiler may detect errors in the format or unused ranges. P.S. You can download the complete source code and related files from here. 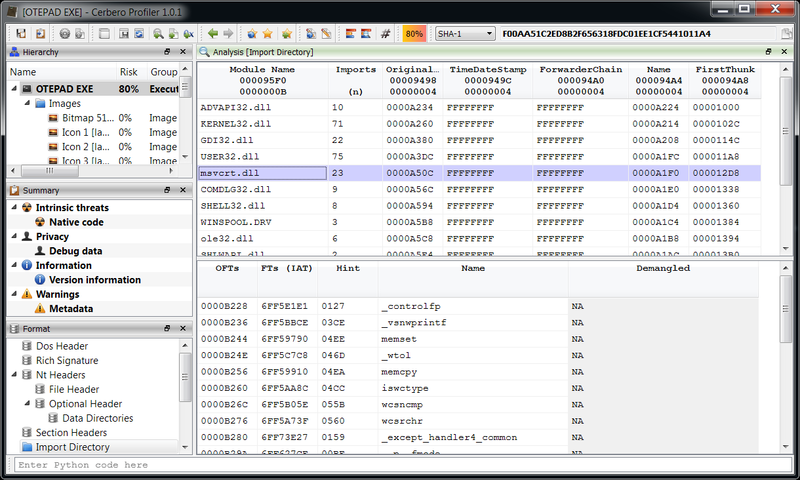 The upcoming 0.9.9 version of the Profiler includes some very useful SDK additions. Among these, the addEmbeddedObject method (to add embedded objects) and a new hook notification called ‘scanning’. The scanning notification should be used for long operations and/or to add embedded objects. In this post we’ll demonstrate these new features with a little script to detect attachments in EML files. One of the advantages of using the Profiler is that we are be able to inspect the sub-files of the attachments as well. 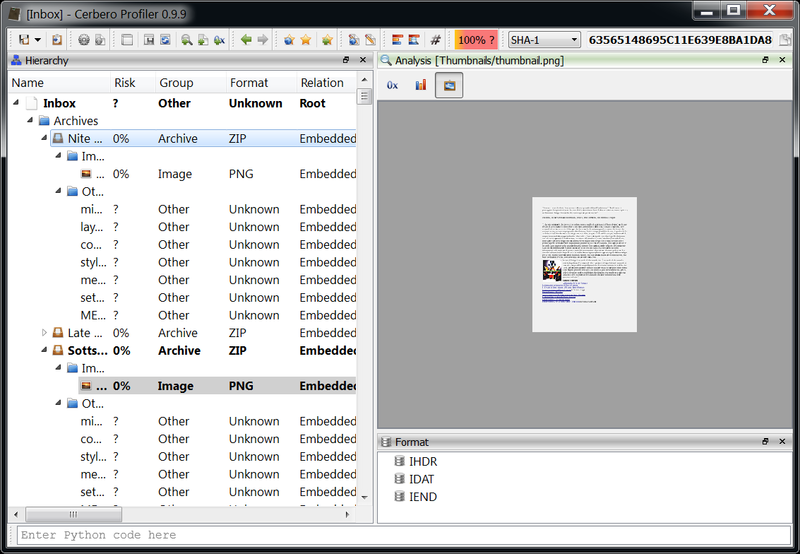 The screenshot above shows a PNG contained in an ODT attachment. Nice, isn’t it? That’s it. Of course, this is just a demonstration, to improve it we could add support for more encodings apart from ‘base64’ like ‘Quoted-Printable’ for instance. Also notice that in the code the addEmbeddedObject method is called by specifying a base64 decode filter to load the file. We can, of course, specify multiple filters and Lua ones as well. This makes it extremely easy to load files without having to write code to decode/decrypt/decompress them. 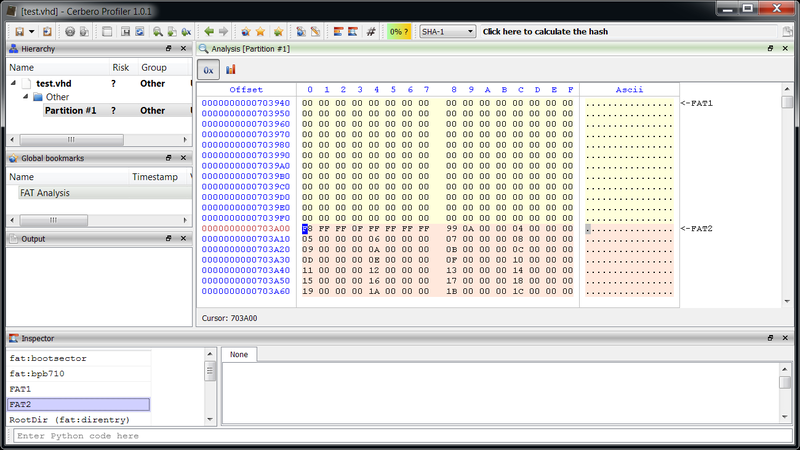 The “?” parameter leaves the Profiler to identify the format of the attachment. In the upcoming 0.9.9 version of the Profiler it will be possible to create docked views even in the context of the main window. This feature combined with custom views is extremely useful if we want to create custom reports at the end of a scan. Some time ago I needed a little script to calculate the format quotas of files in a specific directory and their sub-files: we’ll use this sample to demonstrate the new features. For example we could use it to determine what kind of files and in what percentage the System32 directory on Windows contains. Or we could use it to determine the quotas of files in a Zip archive. To make it even more useful, the script now asks the user before the scan to enter the nesting range to consider. For example the value ‘0’ means all levels (starting from 0). If we want to calculate the quotas of top level files only, we must insert ‘0-0’ (start-end). The files contained in a Zip archive can be calculated with the value ‘1-1’ and if we want to include their sub-files we must insert ‘1’. s = "Total size: " + (prec % (ud["total"] / mbsize)) + " MBs\n"
ui = "<ui bgcolor='ffffff'><hlayout><pie title='Quotas'>"
s = s + "\n" + k + ": " + ps + "% (" + ss + " MBs)"
ui = ui + "<piece quota='" + ps + "' label='" + escape(k) + "' color='" + generateColor() + "'/>"
ui = ui + "</pie><text id='1' linenr='false' hline='false'/></hlayout></ui>"
Remember to activate the hook from the UI before running a scan. Of course, the view will be displayed even after an individual file scan in the workspace. In order to improve the script, we could use an external signature database for those file formats not recognized automatically. This is a perfect example of the capabilities to extend the functionality of the Profiler. While there’s yet no estimated release date for the upcoming version, keep in tune as we hope to publish very interesting stuff soon. In the previous post we’ve seen a brief introduction of how hooks work. If you haven’t read that post, you’re encouraged to do so in order to understand this one. 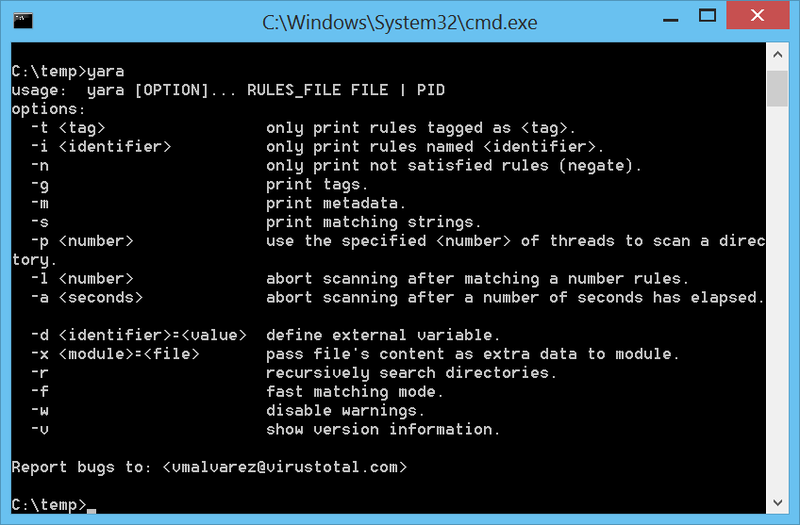 What we’re going to do in this post is something practical: verifying the XML correctness of PE manifests contained in executables in the Windows directory. What the code above does is to ask the PE object for a resource iterator. This class, as our customers can observe from the SDK documentation, is capable of both iterating and moving to a specific resource directory or item. Thus, first it moves to the RES_TYPE_CONFIGURATION_FILES directory and then goes through all its items. If the XML parsing does fail, then the file is included in our final report. Then we need to specify the Windows directory as our scan directory and the kind of file format we’re interested scanning (PE). Let’s wait for the scan to complete and we’ll get the final results. As you can see some attributes in assemblyIdentity contain double quotes. I don’t know whether this DLL has been created with Visual C++, but I do remember that this could happen when specifying manifests fields in the project configuration dialog. Hooks are an extremely powerful extension to the scanning engine of the Profiler. They allow the user to do customize scans and do all sorts of things. Because there’s basically no limit to the applications, I’ll just try to give a brief introduction in this post. In the following post I’ll demonstrate their use with a real-world case. scanned gets called after every file scan and prints out the format of the object. This function is not being called from the main thread, so it’s not possible to call UI functions. However, print is thread-safe and when doing a batch scan will just output to stdout. 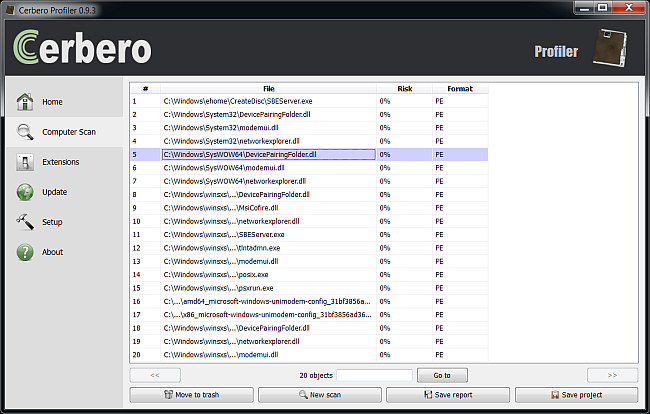 Now let’s open the Profiler and go to the new Extensions view. Ok, now let’s create a small sample which actually does something. Let’s say we want to perform a search among the disassembled code of Java Class files and include in the resulting report only those files which contain a particular string. Let’s activate the extension by checking its box and then perform a custom scan only on files identified as Java Classes. The method ScanProvider::include(bool b) is what tells the Profiler which files have to be included in the final report (its counterpart is ScanProvider::exclude(bool b)). Of course, there could be more than one hook active during a scan and a file can be both excluded and included. The logic is that include has priority over exclude and once a file has been included by a hook it can’t be excluded by another one. Although the few lines above already have a purpose, it’s not quite handy having to change the code in order to perform different searches. Thus, hooks can optionally implement two more callbacks: init and end. Both these callbacks are called from the main UI thread (so that it’s safe to call UI functions). The first one is called before any scan operation is performed, while the latter after all of them have finished. Instead of using ugly global variables, init can optionally return the user data passed on to the other callbacks. end is useful to perform cleanup operations. But in our sample above we don’t really need to clean up anything, we just need an input box to ask the user for a string to be searched. So we just need to add an init callback. Of course, this sample could be improved endlessly by adding options, regular expressions, support for more file formats etc. But that is beyond the scope of this post which was just briefly introduce hooks. 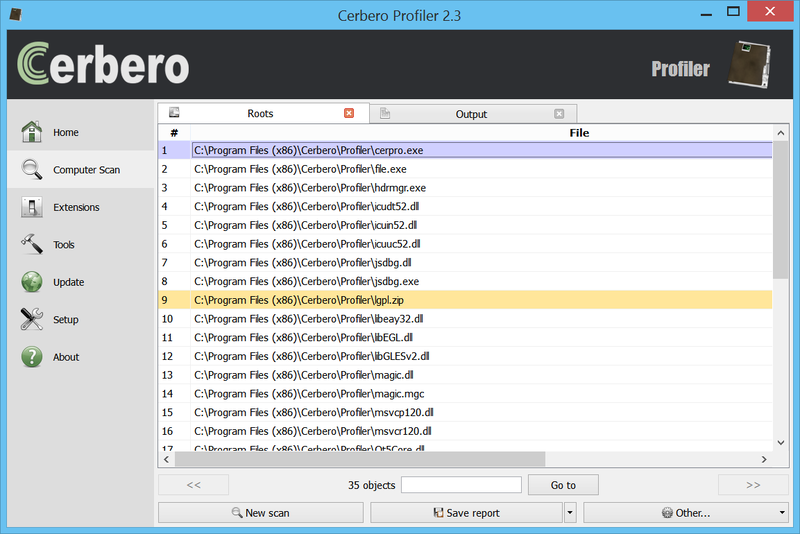 The upcoming version of the Profiler which includes all the improvements of the previous weeks is almost ready. Stay tuned!